I thought I would test IG's platform and I was utterly disappointed. There are no more excuses about 'wallet risk' etc. It is clearly a poor level of service. I wanted to add to my long positions at 18:36 today (12.12.17) in Bitcoin, Ether and Bitcoin Cash all in USD and was unable to do so. "You cannot buy this market to open" - This is the message I kept on getting. If this is the case then IG please close the market until you can offer your clients / customers a level of service which means that during anytime in the week during any hour one can go either long or short in the Cryptocurrencies that you claim to offer. It is just that they are never available when the market is clearly in an extremely strong trend. I totally agree with the above. I am absolutley fed up of ig index and its failure to not open our required positions when needed, especially with bitcoin and etherium. I waste my day waiting for the opportunity, only to be told ‘you can not buy this market to open’. The issue is as we are spread betting BTC and ETH, IG as broker needs to balance their risk. Obviously at the moment long exposure is massive so they have no option but to close trading on these. It is frustrating as I've tried entering a few positions which keep getting rejected. You can always buy actual bitcoins with one of the many crypto brokers but that means forking out big bucks. I invested in XBT Tracker One Bitcoin in EUR and SEK (Swedish Krona) via the broker Hargreaves Lansdown a while back. Both are up by 130% in just 3 weeks. Dealing charges are £11.95 to buy and £11.95 to sell. I accept it is not the same as spread betting which is free from Income Tax and Capital Gains Tax and also you miss out on the leverage but 130% in around three weeks is not to be sniffed at. HL also offer Ether in EUR and SEK too with the same charges. XBT are an extremely big Swedish outfit and are the biggest Bitcoin tracker fund along with the Bitcoin Investment Trust but that was trading at a premium to its NAV and not sure what the premium is right now but so far I have no complaints about the EUR and SEK versions for Bitcoin. It has performed exactly like I thought it would. Just be careful of the currency risk as it tracks Bitcoin in USD and you are using GBP to buy in EUR and SEK so there is 'currency risk' in this investment. Agreed. I gave tried opening long trades at all hours in last,12-24 hours. No joy. Not good. You have to watch City Index's daily interest charges , I just checked and a £1 bet cost £13.60 day, that £4900 year ! Wow!!! Thanks for warning. As frustrating as ig can be at times, it is one of the better ones i think. Having said that, iv not been able to long btc since friday...tried several times each day. Hi all - I am continuing to collate all client feedback and we are looking to better our cryptocurrency offering. We appreciate how frustrating trade rejections can be and we are reviewing other options available. To put it plainly, we simply cannot buy any more bitcoin to reflect your position in the underlying market and hence trades are being rejected. In regards to the actual cost of dealing and holding a position it's really important to look at these as some brokers have extortionate charges. We are very upfront about all costs, risks, charges and effects of dealing, and in regards to bitcoin we are hugely competitive. If you ever wanted to know the costs associated with trading please check out the help and support portal, the IG.com website, or our give out client services team a call for a one on one chat. 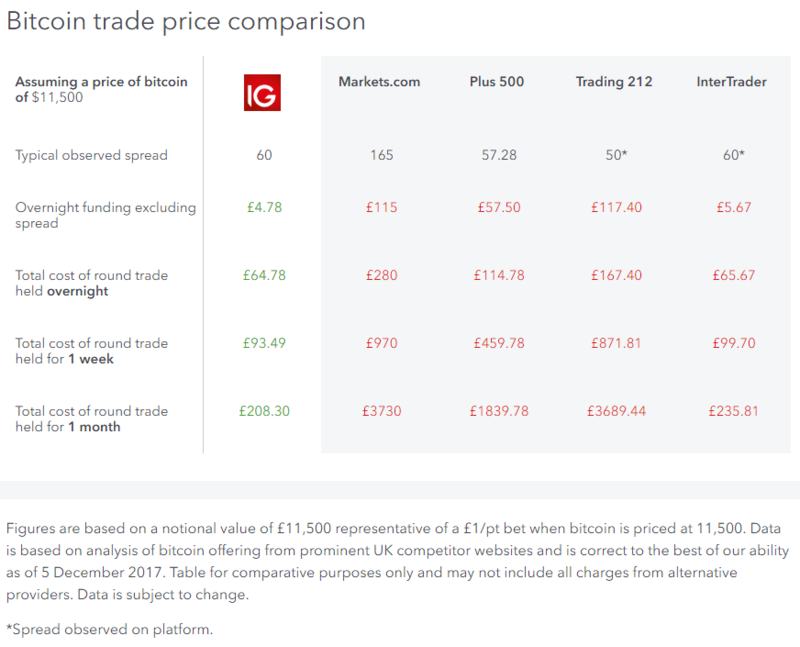 You can see a bitcoin comparison we recently did here (and below), however since then a number of brokers now force you to close your position weekly etc, meaning you would have a pay the spread every week in addition to these charges (IG doesn't do this). Like others have said there are caps with other brokers (some not offering more than 0.25 bitcoin per client, or 18p per point per client max). Does IG have target date for long positoning acceptance of bitcoin, bitcoin cash and ether? Will it be better with the launch of bitcoin future on 18 Dec? I appreciate the Bitcoin issue but Ethereum is not there yet. Also why are you guys dragging your heels over Litecoin, Ripple etc or even BTC/ETH and other intercoin trades?
. This really is a huge issue now james. Its been almost a week iv been trying to set up longs but been rejected. And as said above...this includes the other cryptos. This really isnt fair. Will it get any better at the weekend when it is quieter? I am not able to go long on btc for so many days. I hope you guys can fix it asap! So unfortunately this is impossible to answer as it is completely dependent on client sentiment. You may want to look at this post for some more information. Funny how it always seems to happen when you get small pull backs aswell!! Fyi folks - just managed to get two long orders accepted. Now is the time to try...good luck. 2 weeks and counting without being able buy going into week 3, I know two other people using IG and none of us have been able to long any cryptocurrencies. It's past beyond ridiculous. I hate the word UNLONGABLE. Can IG do something about this? It is getting very irritating. Been waiting 24 hours and still cant buy- what's the point of having money in a platform you cant use? I am pulling out my very limited funds to go to a traditional crypto exchange. The risks is that financial institutions are wary and can close bank accounts with these cryptos exchange or can refuse wire to these institution. And you can only hedge the value dollar to dollar with the actual bitcoin price if u own 1 entire bitcoin, the reason why I came to IG is because of margins and leverage and I can get 1-1 gain at a fraction of an entire BTC cost in terms of USD and most importantly, they are less likely to face banking issues unlike traditional crypto exchanges and IG have a downtime of about 8 hours. Cryptos is 24/7 and some other brokerage is shutting down for the entire weekend and 2 days in crypto a lot can happen. But with this "unlongable" nonsense, i have missed out so many chances of making money and making me think twice about IG as a platform. While IG has mini size cryptos, CME minimum 5 BTC, CBOE 1 BTC, considering it is 20K USD now, it is a little out of my range, I am only a small player James from IG, i hope you can take our feedback, while I agree that IG is a very good platform but the "unlongable" restriction is getting on the nerves of a lot of people, we cannot be looking at the info tab 24/7 hours a day to look when it is "longable" as the timing is entirely random, could IG improve on things and set up some alerts or something. This makes the most common sense to me, thanks! Beware!! As bitcoin had fallen by 20% or so, tried to close a historic short bet. Wouldnt let me...called up they said cannot close any short bets if i have long bets open as it would increase my long exposure. Ridiculous...so dont bother trying to hedge with opposing bets!! !